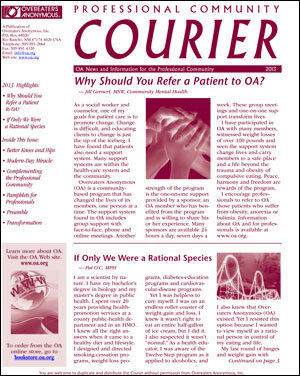 The Courier is OA's annual newsletter directed to hospitals, institutions, professionals and the military. The Courier is OA’s annual newsletter directed to hospitals, institutions, professionals and the military. You may order copies of the 2013 Courier for distribution in your area. Through the Courier, your intergroup carries OA’s message to these institutions and professionals, making them aware of the existence of Overeaters Anonymous and of the recovery program it can offer to their clients, members and patients. While Supplies Last! 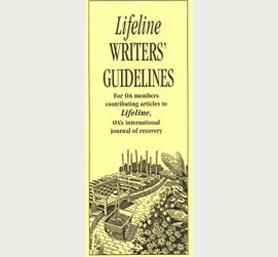 OA members who came to the program not necessarily overweight, including anorexics and bulimics, share their unique challenges and stories of recovery.